Expansionary fiscal policy increases the real interest rate and crowds out private investment – really? The above line is something which you might find in an ordinary economics textbook. Let me repeat it: Expansionary fiscal policy increases the real interest rate and crowds out private investment. The way it is put makes it seem like a no-brainer – unless you take a look at the data. 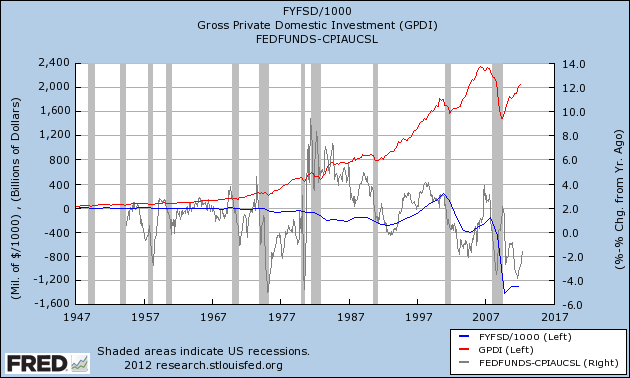 In the above graph the blue line is the federal surplus or deficit, the red line is gross private domestic investment (Wikipedia entry), and the black line is the real interest rate (federal funds rate minus the inflation rate). Now if a statement is put into a textbook matter-of-factly, then I expect to find something else than I actually do find in the graph above. Government debt was rising since the 1980s, but real interest rates fell over time and investment in the private sector increased in levels. Now you might say that with some fancy econometrics you would get the right result, but to that I would reply that you could get any result with econometrics. The statement in the title of this post is a strong one and I would have expected that a quick fact check mission to FRED2 would lead me to nod my head and mumble “yup”. So, my reading is that the Fed controls the nominal interest rate through monetary operations. It is what they want it to be, and changes in government spending don’t drive it. Maybe there is an effect of expansionary fiscal policy on real interest rates, but it doesn’t seem to be the dominating story. A recent empirical study in the JPE actually find evidence in support of this argument, the crowding-out effect. It was authored by Cohen at Harvard and others I can’t recall. They used an interesting natural experiment to test this. Perhaps what you meant is this paper by Cohen/Coval/Malloy (2010). They look at the local level, not the national level. Note, btw, that the effect is largest where firms are geographically-concentrated. I would think that this largely concerns defense spending. Their findings are not incompatible with mine, if you read carefully. Just one example: if government hires workers in one place to build transport infrastructure (highways), it will crowd out private investment where they are building. On the national level, this will crowd in private investment as transport costs are falling and the market gets larger. On page 29 the authors of the paper state the following: “Importantly, however, these calculations should not be interpreted as a valid estimate of the fiscal multiplier, the computation of which is a task beyond the scope of this paper, since they ignore the effect of government spending on private (non- publicly-traded) firms as well as on household consumption, and they ignore the impact of other types of spending (e.g., federal grants, defense spending, etc.–hence we do not capture “total” spending).” They would probably agree with my view. There are others like Richard Werner that genrally argue taht crowding out of private investment through public spending is not caused by interest rate movements, but by reallocating the money supply. This is comes from the fact that government debt can only be settled with base money thereby reducing its quantity.. Regardless of that, wouldn’t you rather look at long-term interest rates to check for a crowding out effect in the IS-LM sense? Thanks for the reply and for the link. I definately will have time to have a look in it. Frankfurt’s summer is not all that nice, either. One of your points i cannot follow, though. where does the cash come from that the government injects into the economy? After all, our government has outsourced money creation to the central bank and thus first has to sell the bonds on the primary markets to banks which then don’t use this money to create credit or if it was money they initinally received as deposits than some private agents are not using it on spending. So the way I understand what you are saying, this only works when government is actually allowed to print money?! Your are right. The Euro problem is that the riskless asset (government bonds) is in fact not riskless. Therefore, sovereign default becomes a problem. In “normal” central banks, things work like I described. Mr Werner does not make that distinction between central banks that can act as lenders of last resort (most important ones minus the ECB) and those that cannot (ECB). I agree, Werner gets the private bank money creation right but keeps insisting that government spending crowds out private spending dollar for dollar and that in nonsense. Gold standard logic would be my guess?